I am generally happy with Mountain Lion but I remember that there was a feature in an earlier version of OS X that seems to have been dropped. In Spaces, there was a number in the menu bar to tell you which “space” you were in. This is missing in Mission Control. Is there any third party utility that will bring it back? Yes. But, unlike with some other OS tweaks, it’s not the kind of thing that Apple has simply hidden that you can reawaken with a clever Terminal command. Instead, you must turn to a tool that essentially recreates the Spaces experience of old, and adds a few tricks of its own. That tool is BinaryAge’s $18 TotalSpaces. Like Spaces, Total Spaces will display a menu bar icon that indicates the desktop you’re currently viewing. From this icon you can select the desktop you’d like to view or choose an overview, which shows you large thumbnails of each desktop (see the image above). You can click on a desktop within this view to choose a different desktop. You can also switch to other desktops using swipe gestures on a trackpad, keyboard shortcuts, or user configurable hot corners. Or, if you like, you can assign a hotkey to a particular desktop and move to it with the press of a couple of keys. TotalSpaces lets you configure many, many desktops. 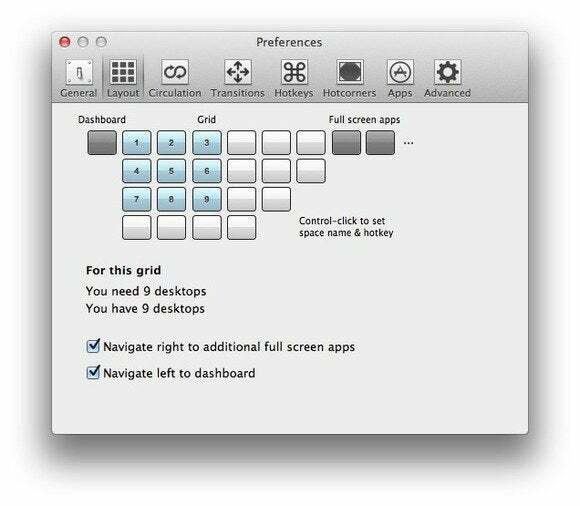 You can additionally change the transition used when switching desktops, drag windows between desktops within the overview, and assign applications to specific desktops. TotalSpaces supports full screen applications as well as multiple monitors. I’ve used it for a few days and it’s stable and helpful. If Mission Control isn’t giving you the Spaces you need, TotalSpaces is worth a look. Give the 14-day trial a whirl and see what you think.